Five wins from ten starters in the first half of August had got the stable’s season off to a flyer. On August 18, the stable added a new winning name to its honour roll when Golden Mean scored on debut. 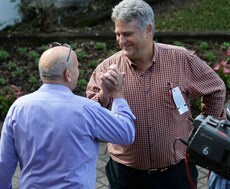 On the same day Tony’s Decree and Cuban Saga both found one too good for them in their respective races but their second placings were both full of merit. A week later, on August 25, Hold The Line made her second race appearance and she again confirmed she had promise to build on when she kept unbeaten record intact in confident enough fashion. All in all, the stable had eight starters during the second half of August for two winners and three runner-up finishes. This took the stable statistics for the opening month of the new season to eighteen runners for a total of seven winners and five minor placings which translates into a 38.88 percent win strike rate and a 66.66 percent return of runners filling the first three placings. That is an exceptional strike rate by any standards. GOLDEN MEAN (3 b f Congrats – Gold Shears). Aug 18: Ipswich – Fillies & Mares Maiden – 1100m. 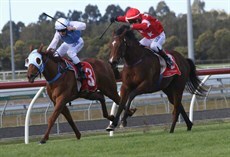 Aug 25: Sunshine Coast – Three-year-old Handicap - 1200m. HOLD THE LINE – Previous wins this season. Golden Mean made her debut on August 18 after participating in two trials in mid-June and mid-July. Both trials were over 850m on soft going. 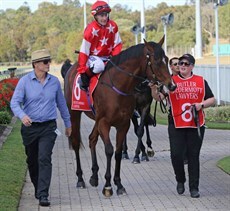 She finished first in the second trial, in spite of clocking a last 600m time which was slower than his first trial, but clearly she had shown enough to put punters on guard and when she stepped out at Ipswich she jumped at the prohibitive odds of $1.75. The punting rumour mill was not wrong. Michael Hellyer got the first-timer into stride well enough and then comfortably tracked the two leaders, albeit three wide, until the field straightened for home where Hellyer quickly asked his mount for her effort. Golden Mean did respond immediately but just took a little while to work through her gears and when Dancing Angel kicked back at her halfway up the straight it momentarily looked like she might have a fight on her hands … but Golden Mean asserted her authority over the final 100m to arguable win more comfortably than the official one length margin suggests. AUG 25 – HOLD THE LINE. After a debut win on the first day of the season, Hold The Line faced the starter for the second time at restrictive odds and duly saluted to keep her unbeaten record intact. Hold The Line landed in midfield and improved up to fourth place in the sweep to the turn less than three lengths off the leader. The filly was niggled at by Jeff Lloyd on the turn and then pushed along in the first half of the straight before Lloyd switched her around the heels of Defence Missile, who had made a determined break for home. At the 200m mark Hold The Line was a length in arrears and she cut that deficit back to half-a-length with 100m left to run. She then gained the upper hand when it mattered most in spite of the fact the Lloyd lost the use of his off-side rein over the final 50m causing him to not fully test his mount. AUGUST 16 – AUGUST 31. 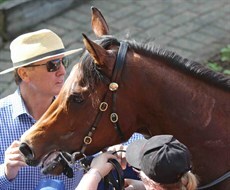 Aug 18: TONY’S DECREE – Ipswich – 3YO Maiden – 1666m. Aug 18: CUBAN SAGA – Ipswich – Class 2 – 1200m. Aug 25: TROIS CHOIX – Sunshine Coast – BM85 – 1200m. 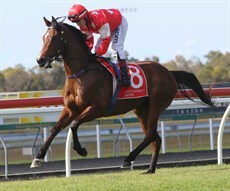 Aug 29: FRANGIPANI MOON – Ipswich – 3YO Maiden - 1200m. Aug 29: LAVENDER BLOOM – Ipswich – Maiden – 1100m.